Last Sunday, SP's family got together to celebrate his birthday. This year's birthday dinner turned into a birthday lunch so that everyone could attend (although in the end one person and the nephew couldn't make it). SP chose Pacific Ring on Murray Avenue in Squirrel Hill. I had eaten at Pacific Ring only once before and I wasn't too impressed that time. 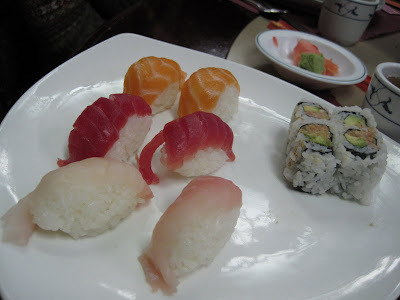 I really wish we could have had a dinner instead of lunch, but since it was lunch, SP wanted Pacific Ring so that he could order the All You Can Eat Sushi, which is on Saturday & Sunday from noon until 4 pm. 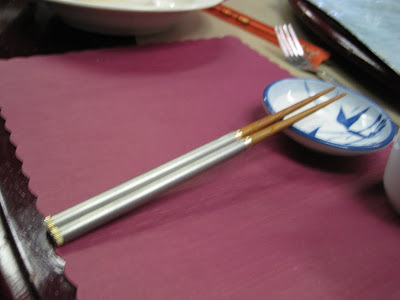 He took his own hashi (in photo above), which were a birthday gift from friends. SP, his dad, and S all ordered the 'All You Can Eat Sushi.' 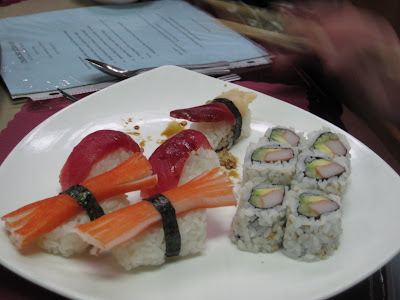 SP and his dad ate 3 plates of sushi; S nearly finished a fourth plate. Despite studying Japanese in college and living in Japan for 2 years, I do not really like sushi. I don't really like fish, especially not raw, and I don't really like seaweed. The 'All You Can Eat Sushi' is served with a salad. The salad looked like iceberg lettuce, cucumber slices, and a few raw broccoli florets. They all chose the ginger dressing: It looks a little too yellow-orange for me, and a little too chunky, maybe too gingery? But I didn't try it. SP said it was just OK. 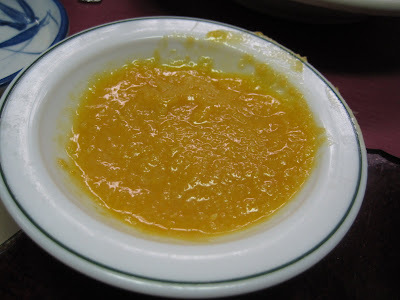 I think it looks like baby food - pureed squash, maybe? 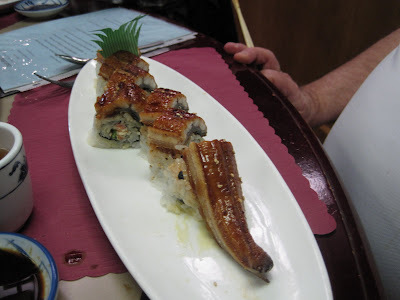 Anyway, here's a couple photos of their sushi plates. Here's the 'Flying Dragon Roll' (seaweed salad, crab, eel on top): This was #2 (California Roll, Tuna Nigiri, Kani Nigiri, Red Clam Nigiri): And here's another sushi plate, #1 (Spicy Tuna Toll, Salmon Nigiri, Tuna Nigiri, and White Fish Nigiri): I decided to have the 'Crab Rangoon' appetizer and the 'Steamed Pork Dumplings.' The crab rangoon was just OK. I've definitely had better elsewhere. 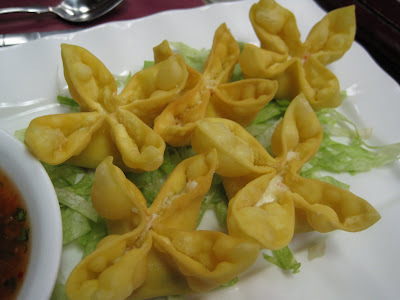 The problem wasn't with the filling but with the fried wonton. I knew right away from the color/look of the fried wonton that these were probably not going to be tasty crab rangoon and I was right. They just weren't as delicious as others I've had, like at Silk Elephant (a couple blocks down the road). 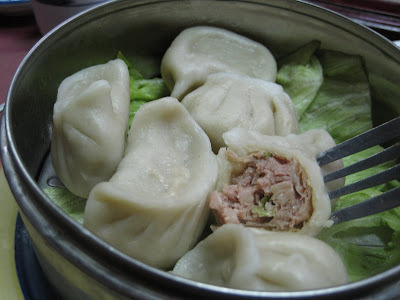 The dumplings were just OK. I prefer fried dumplings. I didn't like the dipping sauce they served with the dumplings - the sauce is much tastier at Sesame Inn or Sichuan House. Googer had miso soup and a plate of edamame, which he enjoyed. Z had Singapore Style Rice Noodle with Curry which was very yellow in color. The yellow color kind of scared me - it looked sort of neon-like. My photo didn't turn out well enough to post it on the blog. She enjoyed it, and there was definitely a lot of food on her plate. ZSO ordered Beef Fried Rice and enjoyed it, although, he, too, had a ton of food on his plate and took about half of it home. This is just not a place I would choose to dine at. For future family gatherings, it would be OK, I'll just try another appetizer or maybe by then I'll feel up to lo mein noodles, which I've been avoiding because the last few times I've had lo mein I've felt really queasy afterwards. But the 'All You Can Eat Sushi' on weekends is a good deal. SP said the sushi is much better than the sushi at Hokkaido Seafood Buffet (I found an online review for Hokkaido that said the reviewer found a cockroach in their soup - gross - I definitely won't be going there and am glad I wasn't able to go in December when there was a family meal there). After such a disappointing lunch, we got to the good part of the day. A trip to Squirrel Hill means a trip to Te Cafe. We each ordered a pot of tea (green for him; Lemon Spice for me) and relaxed at a table while reading the Sunday newspaper. Sadly, we couldn't replenish our depleted supplies of Blue Lady and Orange Spice teas since they were out of those teas, but we did come home with some Lemon Spice tea (very, very good) and Pumpkin Spice, which we each sipped during The Amazing Race and the Oscars last night. Also very tasty with orange chunks of pumpkin for the pumpkin flavor. That's too bad about food. I've always heard such good things about PR. I've never been to Te Cafe. Add that to the list! I went there once and I agree - it was just so-so. I just had some sushi when I was there; didn't get to try the other options. I passed by Te Cafe tonight and wanted to stop in, but the chairs were up and it looked like they were closed/closing, even though it was 7:30. Weird. I'll have to try again.